Today we are announcing the availability of pre-defined map products for the major national & nature park areas in Germany. The initial 12 map area series cover the largest and most popular outdoor activities locations, such as the Bavarian Forest Parks, The Eastern Alps, The Rhine area parks such as The Taunus and Bergstraße-Odenwald and The Coastline national parks of Schleswig Holstein, Hamburg and Lower Saxony Wadden Sea. For each, it is based on the high-quality, official maps of the Federal Agency for Cartography and Geodesy (BKG) at a scale 1:25.000. Designed to make it easier for German customers and visitors to install these large areas of mapping onto their phones, the new pre-defined maps can be purchased from the ViewRanger webshop or obtained via in-app purchasing (for Apple devices – later in February). They can be permanently saved on the phone before a visit, such that they will work without a mobile phone signal. Outside of the Parks maps, customers can buy & install official BKG maps in 1:50k or 1:25k for any area of Germany onto the ViewRanger app. 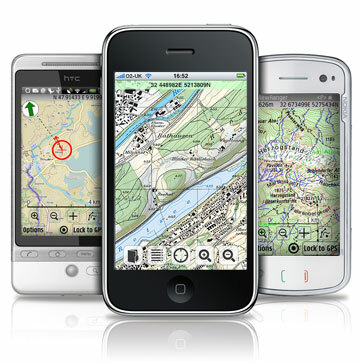 The app also provides access to a range of web based global Open Maps – street, terrain, satellite – that can also be stored for off-line usage. Find out more about the maps for the Nature Park regions here.